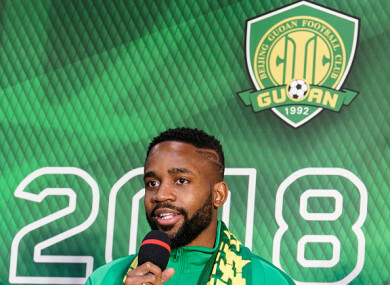 Cedric Bakambu of Beijing Guoan FC attends a press conference at Worker's Stadium. DEMOCRATIC REPUBLIC OF Congo striker Cedric Bakambu was officially presented by Chinese Super League club Beijing Guoan on Thursday, capping a weeks-long transfer saga following his departure from Spain’s Villarreal. The 26-year-old French-born player had announced his move away from Spain in mid-January but the Beijing club delayed an official announcement, even after posting a photo of him training with the team in Portugal. His reported £65 million (€73 million) move appeared to have been complicated by the Chinese Football Association’s decision last year to impose a new 100% transfer tax on deals worth over 45 million yuan (€6 million). Reports suggested the move was structured to dodge the transfer tax. The CFA warned last month that teams evading the levy would face crippling point deductions under new measures aimed at plugging loopholes in the restrictions. The levy was imposed as the CFA worries about an influx of well-paid foreigners following record-shattering signings in recent years. It wasn’t easy for me to make this decision because I was at Villarreal in Spain and I was doing good work there,” Bakambu told a press conference, wearing a green training jacket in the club’s colours. “But now I’m here with my new team and what I want to do is to do everything to score as many goals as possible,” he said in Spanish. Li Ming, the club’s general manager, said the transfer process was “very complicated”. Li declined to reveal the transfer’s amount, saying there was a “confidentiality agreement”. Chinese media have reported that Bakambu signed a four-year deal with an annual gross salary of €18 million. Beijing Guoan finished ninth in the 16-team CSL last season and had appeared determined to buy a goal-scorer before the start of the new campaign. Bakambu, who had joined Villarreal in 2015, scored nine goals in 15 games in the first half of the current La Liga season. The Super League’s new season begins on Friday and will end in November. Email “Outgoing Villarreal star becomes most expensive African player ever as he makes €73m move”. Feedback on “Outgoing Villarreal star becomes most expensive African player ever as he makes €73m move”.